It’s all Greek to me or maybe to my guests the other night. Our family loves Greek food and it really is not that hard to replicate the wonderful flavors you may have enjoyed at a Greek Restaurant. This Greek Chicken Kebab recipe came into my inbox a few weeks ago through my subscription to www.myrecipes.com. I have only had this meal at a Greek restaurant or our local Greek Fest. I decided to have a Greek inspired dinner for some guests the other night and this was the main dish that stole the show, really because I made the entire meal ahead of time! 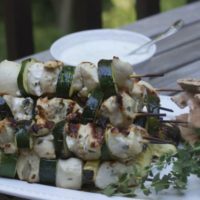 Here is another chicken kebab recipe you can use up any plain Greek yogurt you may have in the fridge. I made a Greek Salad and grilled some pita bread as side dishes. This was a hit with the kids as well. 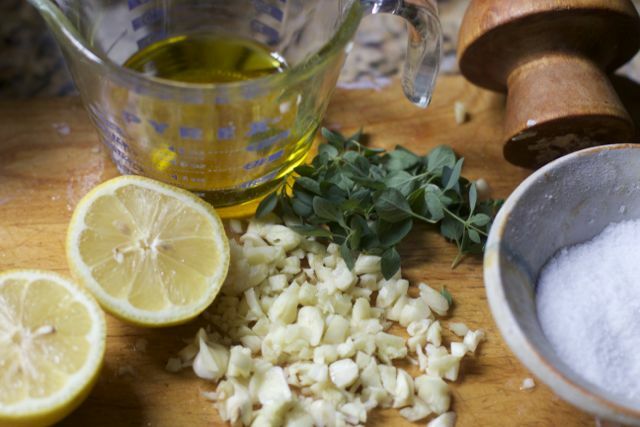 Just look at the amazing Greek Flavors in the marinade: Lemon, olive oil Oregano and lots and lots of Garlic. The best part is that I put this together earlier in the day when I had time and let it marinate for several hours. I don’t see why you could not make this a few days ahead for a larger party and freeze the cubed chicken in the marinade and defrost over night. KEBAB HINT: Don’t forget to soak your bamboo skewers for at least 30 minutes before adding meats or veggies to prevent burning. 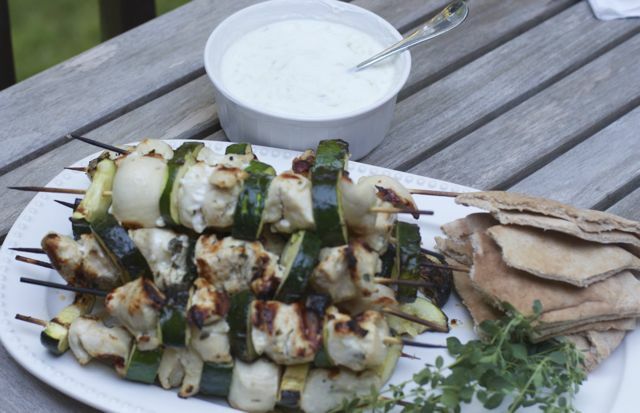 The Tzatziki Sauce could not be easier. 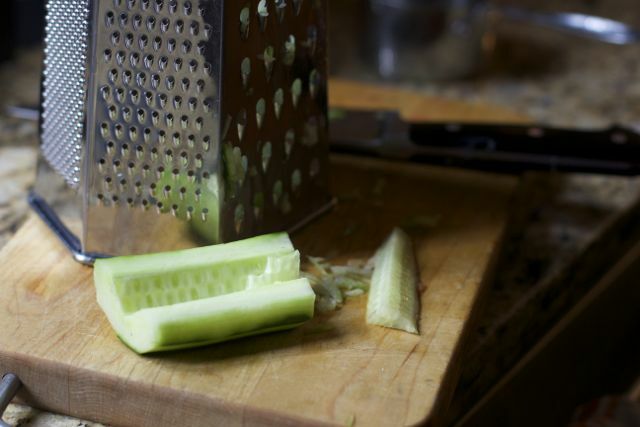 Just grate some cucumber. 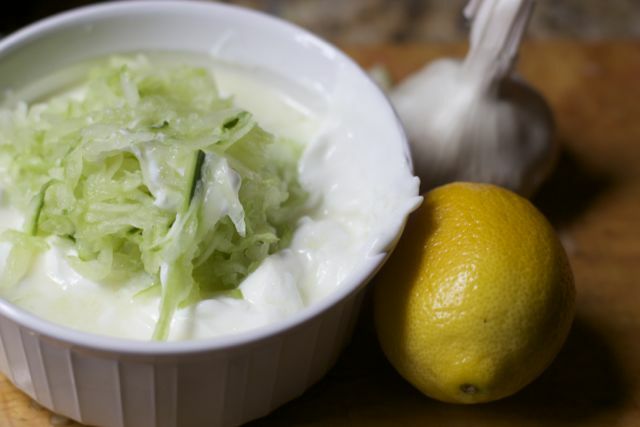 Add it to a mixture of non-fat Greek yogurt, lemon and garlic and allow the flavors to meld for several hours. Dinner is served. Everyone is happy, especially the cook who just need to enlist someone to grill the Greek Chicken Kebabs and everything else just came together. 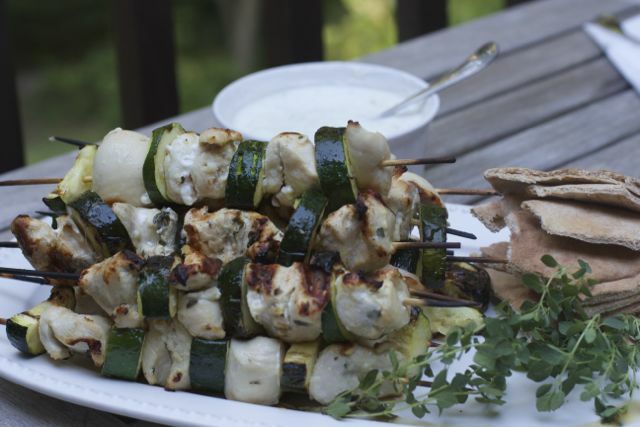 Greek inspired Chicken kebabs are great for guests or a weeknight family dinner. Be sure to double, triple or quadruple this recipe to feed the number of people you are feeding. 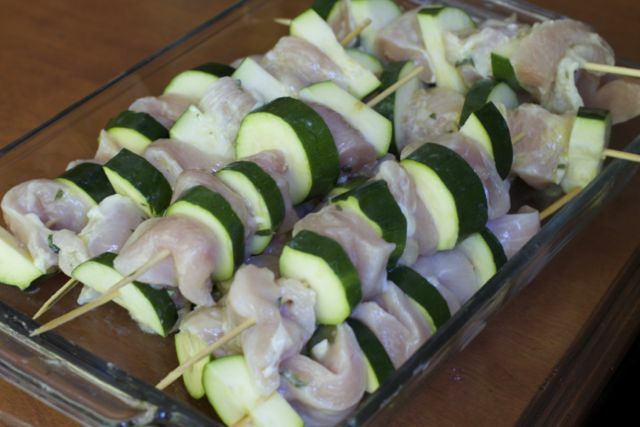 What is your favorite chicken kebabs recipe and veggie combos?